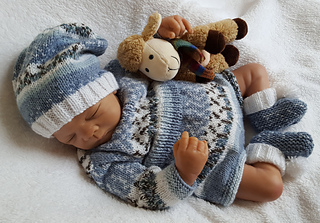 You will receive instructions to knit the long sleeved, short legged baby romper with slouch style beanie and booties. The romper is round necked and button fastening at the back yolk and also at the crotch to ensure ease of dressing for baby. The design is very easy to knit with no complicated stitch patterns making it an ideal knit for the less experienced or new knitter. 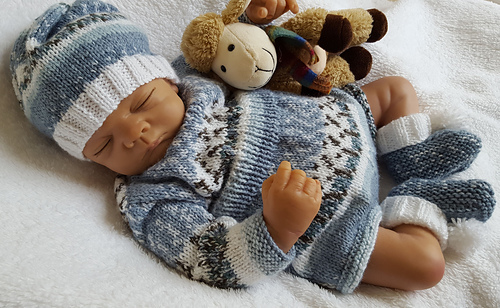 Very versatile it can be dressed up or down and is suitable for both baby boys and baby girls depending on your chosen yarn. To knit the set you will require approx 170g of Baby Double Knitting Yarn (Light Worsted) in Two Contrasting Shades, 6 Buttons.